If you are looking for an established casino with stunning welcome bonus, Platinum Play casino is the place. Platinum Play was established in 2004. It is powered by Microgaming, licensed in Malta and it is part of Fortune Lounge casino network. Platinum Play offers new players 1500 Free Bets bonus to try their games and hopefully, win some money on the way. To increase your odds, we have added a list of loosest slots in Platinum Play – you can find it at the bottom of the page. Restricted Countries: USA, UK, Denmark, France, South Africa, Spain. Here you can find USA Friendly online casinos and UK online casinos. Over 600 casino games. 400+ Slot machines. Live dealer tables. Best online slot tournaments. Slot machines: We won’t start listing here all the slots. Our personal favorites are Microgaming’s special theme slots, such as Jurassic Park, Tomb Rider, Lord of the Rings and the new Game of Thrones slot . 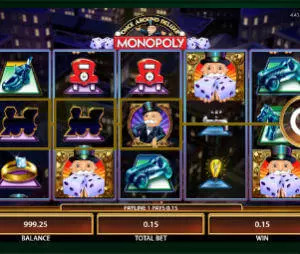 If you are looking to increase your odds, start with Platinum play loosest slots: Break Da Bank Again Megaspin, Hot Ink, Extreme Heat and Big Bad Wolf. All of them offer 97+ RTP. Most recommended progressive slots are the famous Mega Moolah and King Cashalot. Video Poker: single and multihand video poker games: Jacks or Better, Bonus Poker, Deuces Wild, Double Double and many others. Blackjack: Classic, European Blackjack, High Limit, Atlantic City Blackjack, Atlantic City Gold, Big Five Gold, Classic, Double Exposure, High Streak Gold, Hi Lo 13..
Other casino games: European, French and American Roulette , Craps, Baccarat and Keno. Live Dealer games: Roulette, Blackjack and Baccarat tables. Platinum Play is one the best casinos when it comes to online slot tournaments and free slot tournaments. Every second you have at least few tourneys which you can play, starting from free events and up to the most popular online slot tournament worldwide, the International Slots League. International Slots League is an ongoing event with $40,000 weekly prize pool. Click on Platinum Play promotions page for more details. 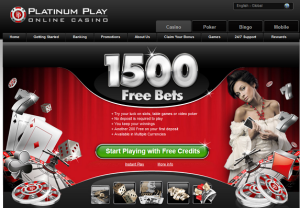 Platinum Play offers one of the most rewarding welcome bonuses. The moment you sign up, you will be rewarded with 1,500 Free Bets bonus. The maximum winings on this bonus are limited to 100 credits, but it gives you a great opportunity to try various games and maybe win some money on the way. Besides the 1500 Free bets bonus, you can double your first deposit with a 100% match bonus, up to $/€ 200. You need to play 1500 credits at least once and you can keep up to 100 credits above the original amount. To withdraw your winnings, you need to deposit at least $/€ 20 and bet 1,500 credits. The bonus terms needs to be completed within 24 hours. No matter how much you win with your Free Bets, you can still claim your 100% match bonus. If you choose to deposits with Neteller, Skrill, Ukash, ECO, instaDebit, ClickandBuy or Entropay, you will get additional 10% bonus on top of the regular 100% bonus. 50 lucky Platinum Play casino players can take part in Fortune Lounge Cruise. All you need to do is to pay attention to your casino inbox, take part in the draws and you can find yourself on-board of the Oasis of the Seas. When everybody were busy arguing whether players will adopt mobile casinos are not, Fortune Lounge were busy building mobile casinos. Platinum Play is one of them. The casino is compatible with every mobile phone or tablet, iOS, Android, Windows phone and Blackberry. It’s well designed, very friendly and easy to use and offers great variety of mobile slots and other casino games. Many online casino loose their appeal on mobile devices. Platinum Play is not one of them. You can deposit and withdraw using almost every possible credit card, debit card or e-wallet. The minimum deposit is $/€ 20. The minimum withdrawal is €50. The withdrawals are processed the following day. Maximum withdrawal per week is $/€ 5000. 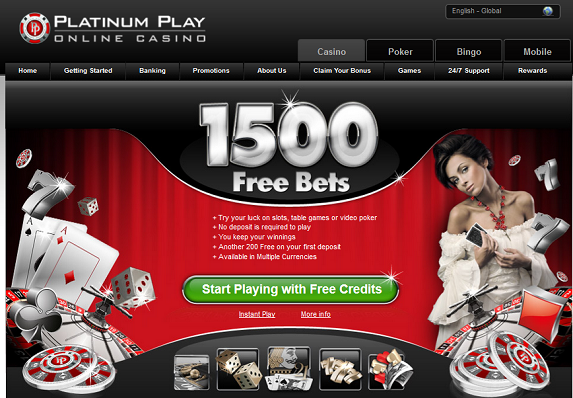 Platinum Play is one of the most trusted and reputable online casino. It’s been online for over 10 years. It is sister casino to other known brands, such as Royal Vegas and Red Flush. It is operated by Digimedia Ltd (known as Fortune Lounge), licensed by Malta’s Lotteries and Gaming Authority and audited by eCOGRA. With 98% payout, Megaspin Break da Bank is the #1 payout slot at Platinum. You should defintely give it a shot, cause it’s a great game to play. The popular Extreme Heat and Hot Ink slots share #2-#3 with 97.5% RTP. Additional slots you should try are the Big Bad Wolf (97.35%) and Big Kahuna Snakes & Ladders with 96.9%. Reputable online casinos tend to offer low welcome bonus. Casino with high welcome bonus tend to be mediocre. Platinum Play is a rare exception: known and reputable brand with lucrative welcome bonus. If you haven‎’t tried it yet, you should.